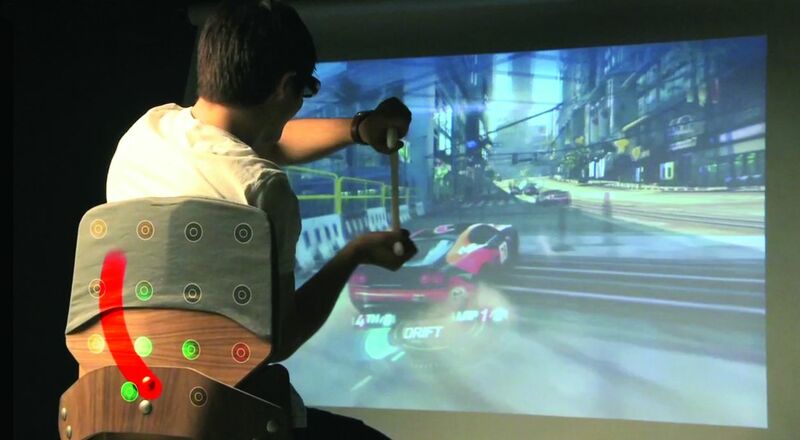 Surround Haptics, developed at Disney Research, Pittsburgh, enhances video game play by using an array of vibrating actuators in a chair to create the tactile illusion of continuous strokes on the player’s back, illustrated in red. In this driving simulator game, it transmits sensations associated with collisions, objects falling on the car, acceleration, braking and more. Surround Haptics, a new tactile technology developed at Disney Research, Pittsburgh (DRP) in collaboration with Carnegie Mellon University, makes it possible for video game players and film viewers to feel a wide variety of sensations, from the smoothness of a finger being drawn against skin to the jolt of a collision. The technology is based on rigorous psychophysical experiments and new models of tactile perception. The technology will enhance a high-intensity driving simulator game developed in collaboration with Disney’s Black Rock Studio. With players seated in a chair outfitted with inexpensive vibrating actuators, Surround Haptics will enable them to feel road imperfections, objects falling on the car, skidding, braking and acceleration; and experience ripples of sensation when cars collide. They will also experience jumping, flying, falling, shrinking or growing, of bugs creeping on their skin, the researchers said. The DRP researchers have accomplished this feat by designing an algorithm for controlling an array of vibrating actuators in such a way as to create “virtual actuators” anywhere within the grid of actuators. A virtual actuator can be created between any two physical actuators; the user has the illusion of feeling only the virtual actuator, the researchers said. As a result, users don’t feel the general buzzing or pulsing typical of most haptic devices today, but can feel discrete, continuous motions such as a finger tracing a pattern on skin. Disney is demonstrating Surround Haptics Aug. 7-11 at the Emerging Technology Exhibition at SIGGRAPH 2011, the International Conference on Computer Graphics and Interactive Techniques in Vancouver, B.C.